Ministry of Statistics has released the new IIP series based on a new financial year, which has now changed to 2011-12 from the erstwhile 2004-05. Most of the macro data released by the Ministry now has been anchored to 2011-12 and this new IIP time series will follow the same base. Also the weights now incorporated by the new series are in line with those used in Gross Value Added (GVA) methodology thus aligning the volume based IIP with net value creation of the economy. These changes make the IIP a more realistic barometer of economic performance. The new series uses NIC data at sub sector level (three digit level) and has deleted irrelevant items from the list. Sectors such as electricity now include data of renewable energy capacity augmentation, given how significant the sub category has become in light of Indian Government’s renewable energy push. Apart from the base year and weights, there have been a few fundamental changes in the new series as well. The Capital Goods category, which as per the old series recorded final units produced in the category will now have a ‘Work in Progress’ perspective; changing the way we look at this category. What this change will do is that it will allow Capital Goods to not remain confined to final units produced but spread the volume to production/ operational cycles of users. We believe that Capital Goods are the basis of industrial production and while the earlier series was providing information regarding items produced (and hence demanded) – there was no apparent connection to value created. Given the demand for the category is driven by factors such as capacity utilization levels as well as demand at the consumer level, the justification to treat capital goods the same way as say consumer durables, lacked merit. It must be understood that Capital Goods are not an end in themselves but a means to an end, which in turn is industrial production. Therefore it makes sense to measure the use of these items over a cycle, since industrial production is rarely a ‘non-business as usual’ exercise. The updated weights too augur well for the category becoming more relevant for overall analysis. 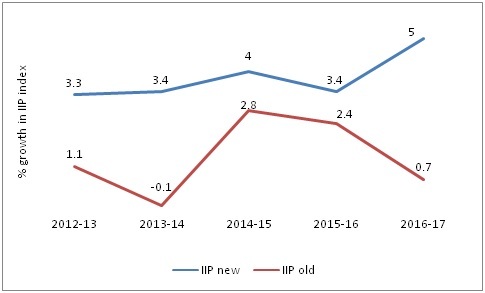 The new IIP series, with updated methodology has given an upward push to the category as its performance is relatively better as compared to the older series (annual basis). In other user based approaches, while basic goods just gets a new name, a brand new category for infrastructure and construction goods has been created. With the attention the category is currently receiving given the massive infrastructure investments and the Government commitment in this regard, this move was anticipated. The category receives a weight of 12.34% in the overall Index and takes away some of the mantle from the Basic goods (now named Primary Goods) and Consumer Non-Durables categories. Interestingly, Consumer Non – Durables goods category, which was until recently recording a massive average decline (as per old series) has gained from this trimming of weight and has recorded a surprising growth of 9% in FY17. We believe that the new base year gives the category some respite from the normalization effects of the older series, which had an exposure to the unprecedented consumer demand growth phase of 2004-2011. Overall, the Index has gained due to these changes by recording a growth of 5% in FY17, when as per the older series it should have expanded by just 0.7%. The sudden spurt can be attributed to base year change and we saw similar anomalies when the GDP (GVA) methodology was updated a few years ago. We will wait until the results of Q1 FY18 for both GVA and updated IIP are available; this will help in making a holistic comparative analysis and understanding.